• 3 bath, 2 bdrm 2 story "Villa" - SOLD - Great Value! 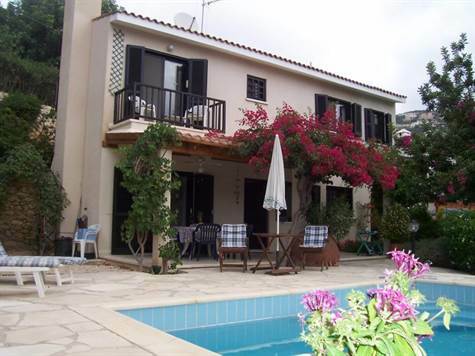 Kamares , Tala - This beautfiul detached villa boasts 632 sq. meters including the plot. It features 2 bedrooms, 2.5 bathrooms, a spacious open plan living and dining room. The modern kitchen with a pantry for extra storage leads out to a veranda. The living room also leads to a relaxing patio setting that is covered by a large pergola topped with bougainvillea flowering plants and an outdoor overhead fan. The home also has fly screens throughout, a cast iron coal effect gas fire in the living room, A/C in the bedroom, a private pool in a beautiful fenced garden, breakfast bar & dishwasher in the kitchen. Kamares Village was awarded in 1993 the “Prix d’Excellence” award by FIABCI as one of the top five best residential projects in the World. A medical emergency service center in Kamares Village will begin operation in 2007 - 7 days a week, 24 hours a day.